October 1, 2015 by Ecommerce News. 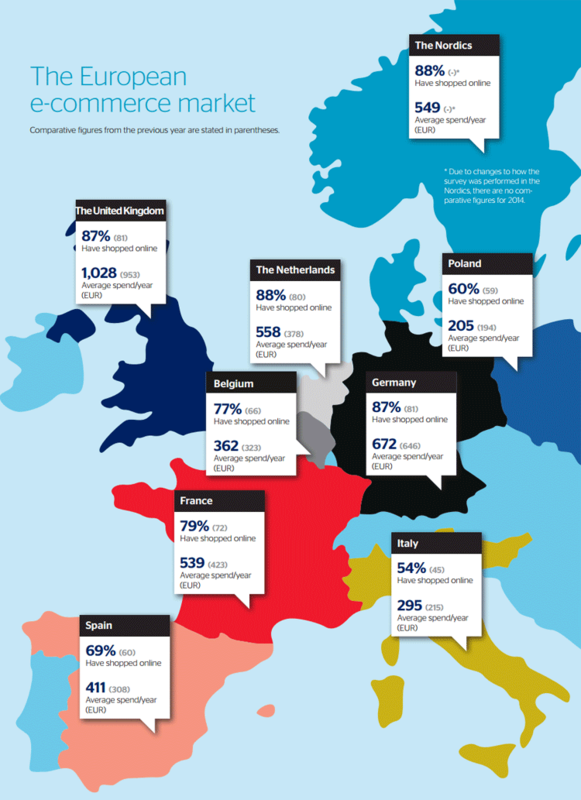 About Consumer behavior, Statistics with tags Europe. 1689 views. Consumers in twelve major European countries have spent a total of nearly 180 billion euros while shopping online last year. This is 10 billion euros more than in the previous year. 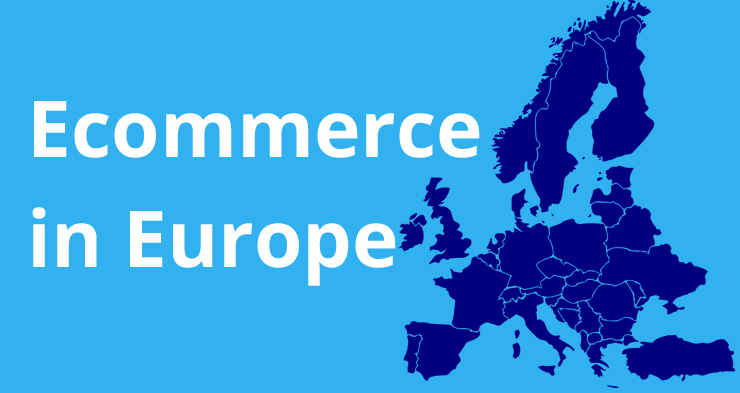 Especially, ecommerce between countries – both within and outside Europe – is on the rise. 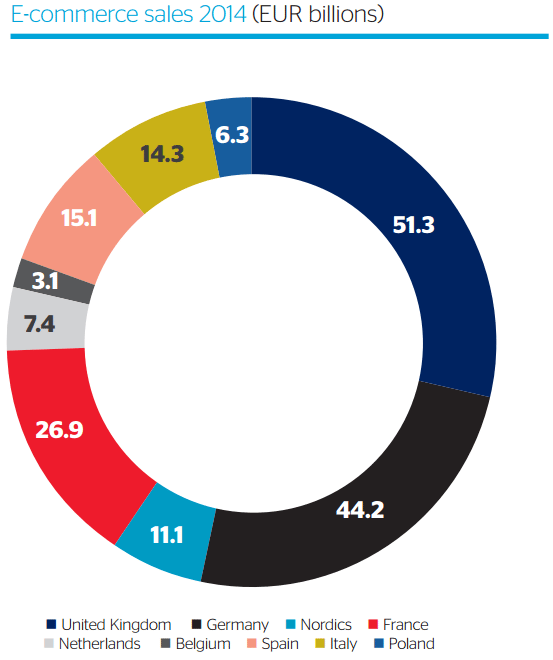 PostNord concludes this in its ‘E-Commerce in Europe‘ report. It surveyed over 11,000 consumers in Belgium, Denmark, Finland, France, Italy, the Netherlands, Norway, Poland, Spain, the United Kingdom, Sweden and Germany. The Nordic postal company found out that an increasing number of Europeans shop online regularly and spend on average more than they have before. And on top of that, cross-border ecommerce is getting more popular. Compared to last year, nearly 11 million more Europeans shopped online from abroad at least once. This kind of shopping is most popular in the Nordics, where 70 percent of consumers did this. That’s more than the share of consumers in the United Kingdom (58 percent) and Germany (53 percent) who shopped at foreign ecommerce sites. 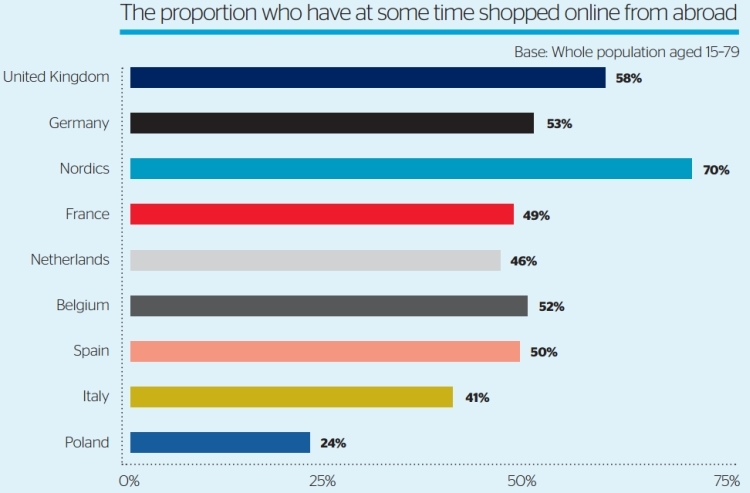 PostNord checked what the consumers in the surveyed countries spent online and it found out that those in the United Kingdom spent an average of 1,028 euros per person on online purchases. This is by far the highest figure in the survey. For comparison: in the Nordics consumers spent an average of 549 euros online and in Italy this was even lower, with 295 euros per person. In all European markets, the most popular product categories are clothing and footwear, consumer electronics and books. But online grocery shopping is on a rise, especially in the United Kingdom. In the two other major European ecommerce markets, those of Germany and France, purchasing food online is also popular. Upcoming popular product categories are sport and leisure (particularly in the Netherlands) and beauty products. In most surveyed markets, debits and credit cards are the most popular online payment method. In large parts of Europe, with the exception of the Nordics and Belgium, PayPal and similar payment solutions are also popular. More interesting statistics can be found in the report, which can be downloaded for free.